OnionMail is an anonymous and encrypted mail server made ​​to run on the TOR network without losing the ability to communicate with the Internet. With whom you are communicating. What are you reading or writing. All OnionMail servers are configured as TOR hidden services and use SSL (via STARTTLS). To use OnionMail all you need is an email client connected to the TOR network without install any special or complicated software. (Example: Claws-Mail or Thunderbird). All OnionMail server are connected in a federated network to check the SSL certificates and working state. All federated server can connect to the Internet via exit/enter servers to forward messages between networks. OnionMail through the exit/enter nodes forwards messages between networks TOR and internet in a transparent manner. Some special protocols implement the possibility not to use obligatory the TOR network addresses with 16 alphanumeric characters using the address registered with the enter/exit servers. Nobody is obligated always to use the addresses of 16 characters of the TOR network. The OnionMail server type uses asymmetric encryption. Each inbox are encrypted with RSA asymmetric keys encrypted with different users' passwords. Obtaining the keys of the server nobody can read messages from users' inbox. All data are saved in encrypted form and chopped files using an hash algorithm. In this way an attacker can't obtain the reverse path to get informations or metadata of any users and their activities. The messages are saved only on the server of the recipient. In case of errors during sending the message, you will get an error message on the mail client. 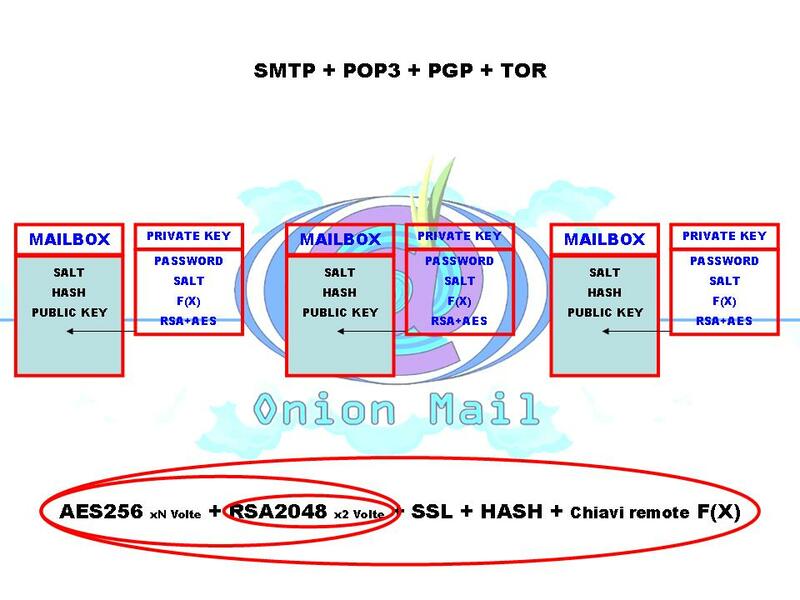 OnionMail uses POP3 protocol with SSL to obligate the user to read all messages and delete all messages from the server. Every file is deleted via wipe to prevent forensic recovery of messages or other user's data. When an OnionMail server start it negotiate some function F(X) with other servers. The keys are chopped, encrypted and calculated from a lot of F(X) spread into the TOR network. All F(X) are controlled by auto destruction KCTL certificates. The auto destruction certificate can activate, deactivate or destroy the keys on all F(X) nodes without access the original OnionMail server. This provides the ability to delete the keys of the server in the event of theft or seizure without require server access. Spam is short-lived because there are the custom blacklists. So each user can set their own spam filters. In the OnionMail's network are introduced some types of e-mail addresses. Some suffix of mail address are reserved to get the type of mail address: User, M.A.T. Protocol address, SysOp, servers, mailing list and applications. All OnionMail server are anonymous and the system administrator can't read any message or get a list of users. With other configurations the system administrator can give an invite code to user to subscribe only one mail address. This way is used to change the subscription policy. Using the registration via web (at the TOR hidden service). Using the wizard for TAILS. Sending a message NEWUSER to the server with your public PGP key to get your account settings. Multiple instances of server. (multiple indipendent hidden services). Native PGP integration for subscriprion and server`s message. Subscription via PGP encrypted email. VMAT Protocol (can use normal mail address without .onion). Multiple encryption everywhere, RSA + AES + RSA + AES with salt. Support unicode password (UTF-8 password and 2048 bits keyfiles). Inhibition of store any message in relay server. (Only direct connection is allowed without multiple connections). Metadata protection. NSA or GCHQ can't read your metadata. AntiSpam, blacklist and realtime filters. Decentralized trust system for SSL certificate and public keys and exit list. Garbage collector to remove automatically old messages. Clock and time zone spoofing. Add / Remove mail address or mail server in blacklist. Mailing list Subscribe / Unsubscribe. Request of server "rulez". (Server help). JAVA Implementation for all platform. Localhost control port and server API. Protected server password and keys not saved on the server. RSA Server and Tor connection authentication. Enter/Exit server to connect Tor to Internet and viceversa. Strong cryptography (RSA 2048 bits, AES 256 + AES 256 + AES 256 x 7). Password key derivation via multiple keyfiles and passwords. Deleting files with wipe by default. Message headers filtering to hide informations and sigint. Exit node selection to connect to internet. M.A.T. Protocol to connect correctly Internet, Tor, email and OnionMail. Server identification request via email to obtain the ssl certificate fingerprint. Self headers rebound to verifiy the client's mail headers and OnionMail filtering. User subscription wizard (on TAILS). Web dynamic pages via OnionMail's ETEX system. Mail queue (only exit server). Multi delivery (TOR and Internet addresses). Sender verify via SMTP test. Remote DNS_MX query via exit/enter node. F(X) remote keys function (BOOT/PUSH/DERK).